Photos by Kids > New to the Hobby. Hi everybody. 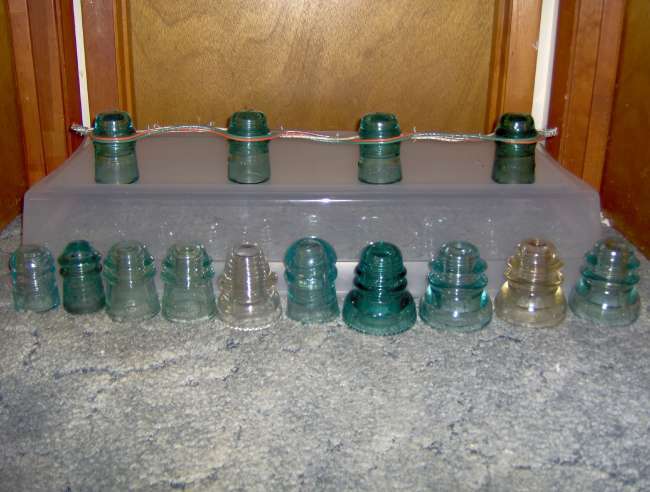 In the last two weeks, I took up the hobby of insulator collecting. I only have 14 so far, but the collection is growing. I'm a young beginning collector in Florida, and I acquired most of my collection on a trip to Connecticut. The collection so far consists of Some Hemingrays, Whitall-Tatums, Am. Tel. & Tel. Co, and Brookfields in different sizes and colors. Right now, I don't know the CD numbers or the value of them. Any info and tips on the hobby will be appreciated. I also bought some wooden pins from an ICON member so that I can display them proudly outside. Also see my other picture of the 4 AT&T insulators wired up by me, I thought it was pretty cool looking, but tell me what you think. The pic will be in the outdoor display section. Thanks for welcoming me into the insulator collectors community everyone! Note: See [id=162433114] for my updated collection!